The Monster Spectacular show is coming back to the Olympic Stadium, in Montreal, on Saturday, April 6th, 2019 ! Don't miss the amazing sounds and carnage from the biggest trucks, 4x4 and motorbikes in the world ! Three hours of non-stop action, a breathtaking thrill for the whole family ! 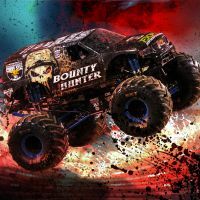 You will get to see 12 Monster Trucks including world champion BOUNTY HUNTER, as well as USHRA champion AVENGER (Jim Koehler), the Black Stallion and many more ! 2Tickets.ca acts as a third party and is in no way associated with Monster Spectacular.